Nutella has been the hardest thing for me to give up since switching to a low-carb lifestyle. There are dozens of recipes out there for making your own low-carb Nutella. Unfortunately, I simply don’t have the time or energy to try any of those recipes. Cracking, toasting, peeling, drying hazelnuts just sounds like too much work. I mean seriously? So I’ve never really bothered and kept sneaking in a tablespoon of Nutella here and there during the day. 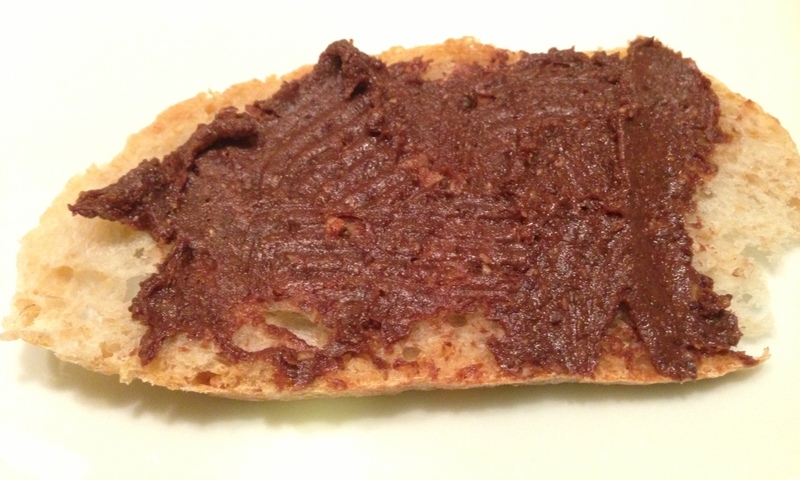 A side note, I never eat Nutella on bread – that’s for wimps! I eat Nutella the way my mum taught me to – a big spoonful straight out of the jar mixed with slivered almonds – yum! Well last night, when I was in class, (concentrating very hard on what the tutor was rambling on about), I had a sudden brain wave. What is Nutella? Toasted hazelnuts ground into a paste with a little oil and chocolate. I kept staring at the packet of Koko Black Roasted Choc Hazelnuts and started wondering if I could turn it into a beautiful low carb chocolate spread. Guess what? It worked, and it worked REALLY well. Regular Nutella has 54g of carbs per 100g. My version has 20.4g of carbs per 100g. The hardest thing about this recipe is resisting the compulsion to polish off the bag of nuts before they make it to the food processor. But if you manage that, then you’re on your way to a lifetime of beautiful luscious hazelnut chocolate goodness. Place hazelnuts into a food processor and blend into a paste, as it’s blending, drizzle the oil in. Keep going until you get your desired texture. I don’t mind it a little bit nutty; after all I add slivered almonds to my Nutella. But if you like it super smooth; keep blending. Add the heavy cream and give it another quick blitz. Not too much after adding the cream, otherwise you land up with churned butter. Transfer to a container and allow to sit in the fridge. The spread will set in the fridge.